The Science Undergraduate Research Experience (SURE) Conferences, which took place on Friday 28 September, were packed to the seams with over 400 science students and academics in attendance. The conference opened with a keynote address from the Minister of State for the Office of Public Works and Flood Relief, Kevin ‘Boxer’ Moran, TD, which took place in Athlone and was live streamed across the three venues. 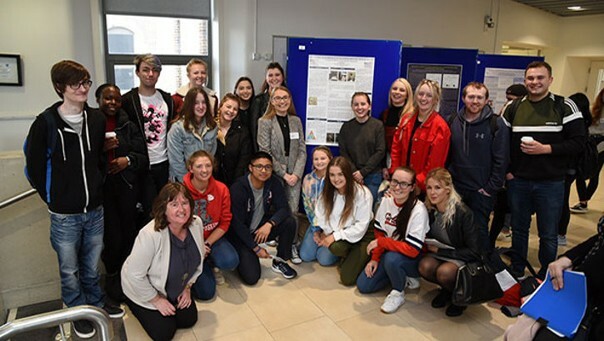 At the Dublin venue, nine students gave oral presentations and a further thirty students showcased their work through a poster presentation. Awards were given on the day for the best scientific presentation and poster, and were presented by Professor Michael Devereux, Director and Dean of the DIT College of Sciences & Health and Dr Jennifer Brennan, Director of Research and Innovation, Technological Higher Education Association. Details of the awardees for the Dublin conference are included below. The event also included a panel discussion by DIT postgraduate students who shared their first-hand experiences on the front lines of research, along with talks on career planning, getting past the interview stage, and funding opportunities for postgraduate research. The conference Twitter feed was hopping throughout the day, and you can re-live all the action here. The Science Undergraduate Research Experience (SURE) Network was established in 2017 by a community of twelve Institutes of Technology interested in enhancing practice in undergraduate research in the Sciences. Best Poster Presentation - Elena Walsh (DIT) "The Development and Validation of Reverse Transcription Polymerase Chain Reaction (RT-PCR) Mutation Scanning Assays for the Initial Investigation of Biochemical Genetic Disorders"
SURE Audience award for Best Poster - Jonathan Brady (IT Tallaght) "Investigating the Effects of Antibiotics and Natural Compounds on Bacterial Growth and Formation of Biofilms"